Mercadito’s carnitas tacos. Photo courtesy of Mercadito. Mercadito is modeled after the markets that chef Patricio Sandoval shopped at while growing up in Mexico. The menu is full of a wide variety of tacos like blackened swordfish, beer battered mahi mahi, carnitas, chile-morita rubbed pork belly and, for vegetarians, the hongos with wild mushrooms, tomato sofrito, queso fresco, salsa roja and crispy manchego. We love all the ways Mercadito celebrates tacos. 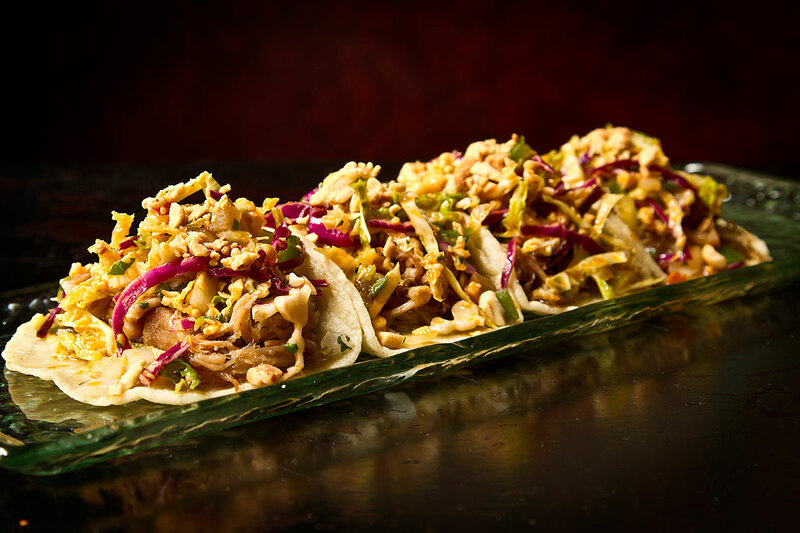 On Sundays and Mondays they offer all-you-can-eat tacos for $24 (excluding langosta and specialty tacos). You can also do mix and match tacos for happy hour or dinner. Instead of trying to narrow it down to one type of taco, guests can mix it up and grab a plate of camaron, Baja estilo or pastor to satisfy a variety of tastes. Throughout dinner, tacos are $4 apiece, while happy hour prices are $3 per taco (minimum of two tacos for dinner, excludes specialty tacos). Tacos & Beer. Photo by Mikayla Whitmore / Las Vegas Weekly. As the restaurant name suggests, this is where you go for tacos and a good beer. There are 20 rotating beers on tap and several dozen more available in bottles. There are also nearly 20 different kinds of tacos that average about $3 apiece. Varieties include carne asada, chicken tinga, pork al pastor, shrimp and fish. We love the barbecue beef tacos with beef, barbecue sauce, cheese, lettuce, sour cream and mashed potatoes in a crispy shell. Vegetarians will appreciate the rajas con crema tacos — roasted poblano peppers, onion, corn and mushroom simmered with Oaxaca cheese and poblano cream. KoMex Express, 4155 S. Buffalo Dr.
Korean, Mexican and American food might sound like an odd combination, but trust us, it works. KoMex Express serves things like the fusion tacos — a choice of meat with KoMex slaw and pico de gallo on corn tortillas. The meats include pork belly, calamari, fish and shrimp. 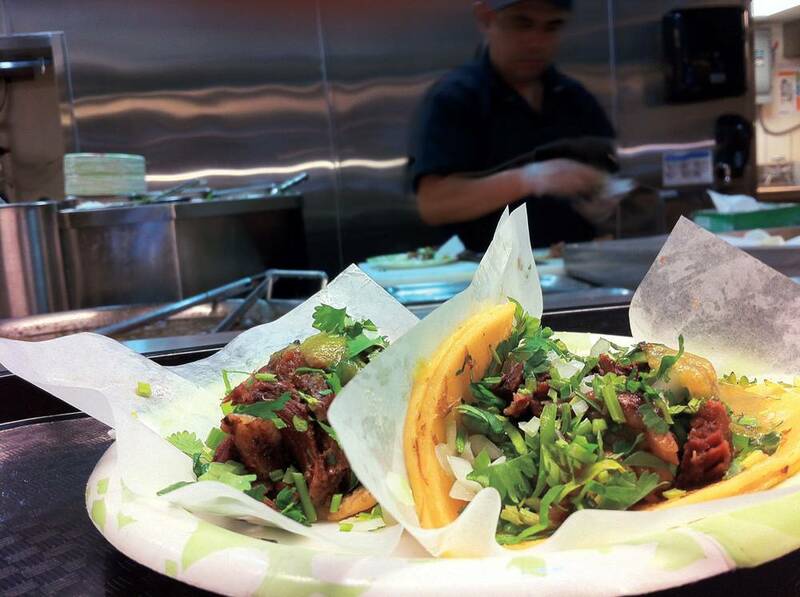 KoMex also has Mexican-style tacos with a choice of carne asada or chicken with onions and cilantro. Los Tacos. Photo by Beverly Poppe / Las Vegas Weekly. Los Tacos, 1710 E. Charleston Blvd. 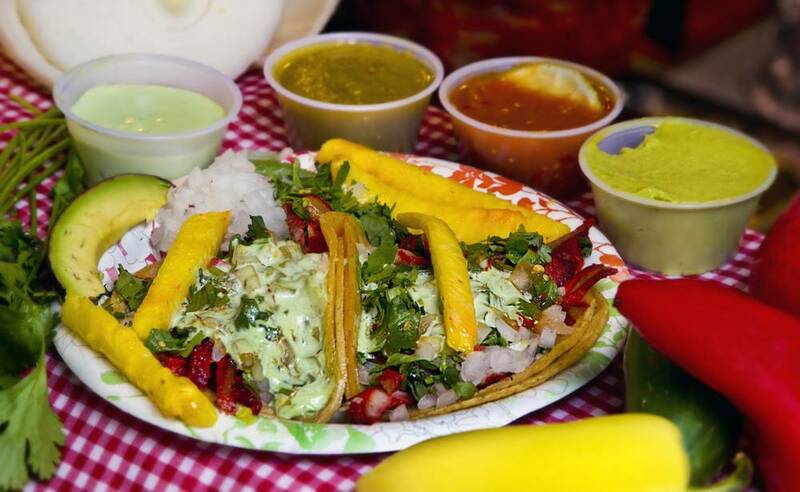 or 4001 W. Sahara Ave.
Locals favorite Los Tacos serves up delicious tacos in warm corn tortillas. Meat choices include carne asada, carnitas, chorizo, cabeza, lengua, al pastor, chicken and ham and cheese. Tacos are $3 and you can kick them up a notch with additions like cheese, avocado, sour cream and extra meat. 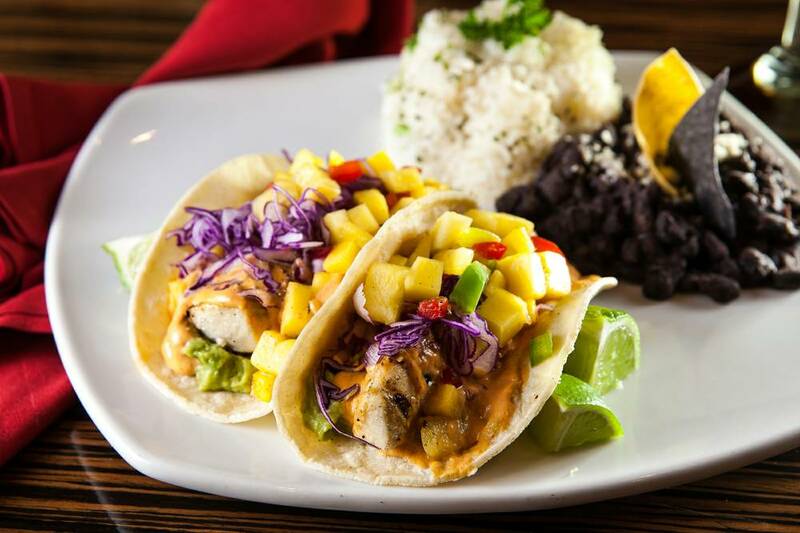 This restaurant from celeb chefs Mary Sue Miliken and Susa Feniger, serves fresh, healthy Mexican food and we love the taco options on their menu. Tacos are served with rice and organic black beans. Try the Wagyu beef tacos with pineapple guajillo marinated Wagyu beef, grilled pineapple salsa and guacamole. Other options include brisket tacos, fish tacos and our favorite, the crispy rajas tacos – creamy potatoes, roasted chiles, Mexican cheeses, guacamole, charred corn relish and chipotle crema. Taco y Taco. Photo by Brock Radke / Las Vegas Weekly. Taco y Taco, 9470 S. Eastern Ave.
At first glance the ordering counter at Taco y Taco can look confusing but don’t be intimidated. There are different lines depending on the meat you want, so just read the signs and get in the line that’s serving what you want to order. There are a variety of meat options including chicken, chorizo, barbacoa and carnitas — all served on corn tortillas. Each one is loaded with meat, cilantro, onions and salsa. The restaurant also serves vampiro-style taocs. No, it has nothing to do with vampires. It just means your taco ingredients are stuffed between two tortillas and melted with cheese. Tacos el Gordo. Photo courtesy Las Vegas Weekly. Tacos el Gordo, 1724 E. Charleston Blvd. This family owned and operated taco shop from Tijuana opened in Las Vegas in 2010 and has been making taco fans happy ever since. Tacos are served in handmade corn tortillas and topped with guacamole and salsa. For meats your options include carne asada, adobada (spiced pork), brisket, Azteca (with beef and cactus), lengua and more. Pepe’s Tacos, 2490 Fremont St.
We love Pepe’s because they’re open 24 hours to satisfy your taco cravings anytime. They have several locations around town. Soft tacos are served with your choice of meat onions, cilantro and hot or mild salsa. Meats include asada, carnitas, lengua, birria (marinated goat meat) and chicharron (pork skin). 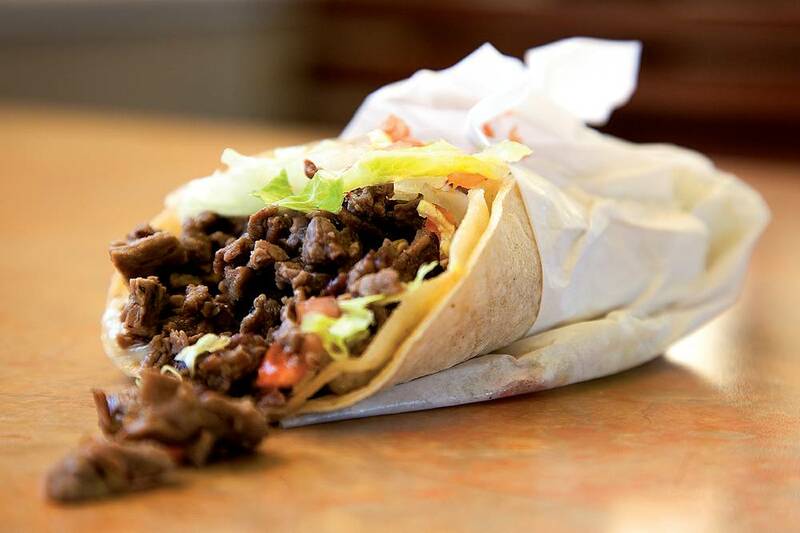 Hard shell tacos are also available with beef or chicken. El Dorado Cantina. Photo courtesy Las Vegas Weekly. This restaurant serves tasty tacos using organic and sustainable ingredients and hormone-free meat. You can get street tacos (three per platter), which are served with cilantro and rice and either refried or black beans. Choices include carne asada, carnitas, al pastor, cochinita, pulled chicken or corn rajas (roasted chiles, poblano, onion and sour cream). El Dorado Cantina also has a menu of signature tacos that come in two per platter and include grilled mahi, shrimp and veggie. Watching those carbs? Try a lettuce wrapped taco with steak or chicken topped with fresh guacamole, chayote, carrots, pico de gallo and queso fresco. Taqueria el Buen Pastor, 503 N. Las Vegas Blvd. At this taco stand you’ll find authentic Guadalajara Mexican tacos. Try the tacos al pastor served with pineapple or choose from chicken, lengua, chorizo, taco ranchero with seasoned pork, seasoned grilled steak or chicken, chorizo and more. There’s a self-serve bar where you can choose from salsas and toppings like radish, cucumber, onions and cilantro. 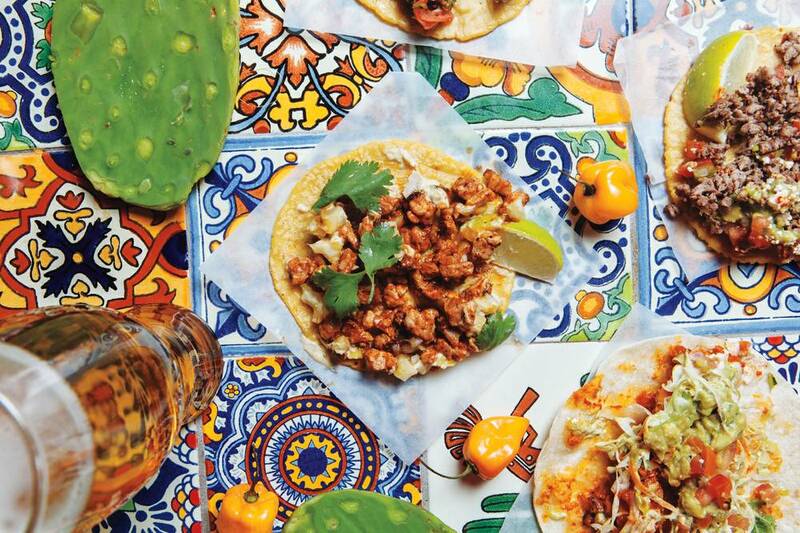 Check out more options for tacos and Mexican food in Vegas.com’s dining guide.